We watched the 2009 Oscar-winning documentary film Man on Wire the other night; it tells an incredible story. 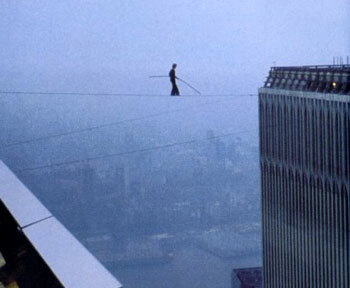 After years of dreaming and months of planning, 0n August 6, 1974 French tightrope walker Philippe Petit and his accomplices, employing ruses and hiding from guards, sneaked onto the roofs of the north and south towers of the World Trade Center. During the night they rigged a cable between the towers–shooting fishing line attached to an arrow from one tower to the other, then pulling across heavier strings, ropes, and ultimately the heavy cable–and secured it with guy wires attached to the WTC roofs. Then early on August 7, after working all night to prepare the wire, Petit stepped off the roof and onto the cable. For 45 minutes he walked back and forth, played cat-and-mouse with police, lay down on the wire to gaze up at the sky, and captivated Manhattanites and commuters who stared into the sky not quite believing what they were seeing. Petit was arrested when he returned to the roof, but the charges were eventually dismissed. See it.